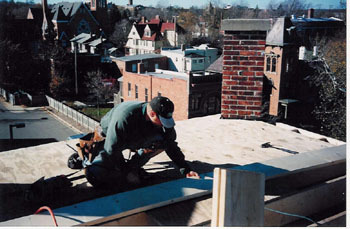 Ypsilanti Restoration was founded in 1997 as a sole proprietorship. We became a L.L.C. in the winter of 1999/2000 . Since the company's founding we have worked for a wide variety of clients including churches, universities, historic property owners and residential home owners. We often work with historical organizations and architects to assure integrity of the finished product. At Ypsilanti Restoration L.L.C., we place emphasis on maintaining high quality workmanship. We employ only experienced and dependable workers with an eye for detail. We strive to maintain courteous and friendly relationships with our clients. We are licensed builders by the State of Michigan (#2102158228) and we are proud members of the National Association of Homebuilders and its local affiliates. Our policy is safety first, but we are fully insured for liability and workers compensation. Certificates of insurance are available if needed. We have a long list of satisfied clients. References will be provided upon request.